With the introduction of Azure DevOps today, we’re offering developers a new CI/CD service called Azure Pipelines that enables you to continuously build, test, and deploy to any platform or cloud. It has cloud-hosted agents for Linux, macOS, and Windows, powerful workflows with native container support, and flexible deployments to Kubernetes, VMs, and serverless environments. Microsoft is committed to fueling open source software development. Our next step in this journey is to provide the best CI/CD experience for open source projects. 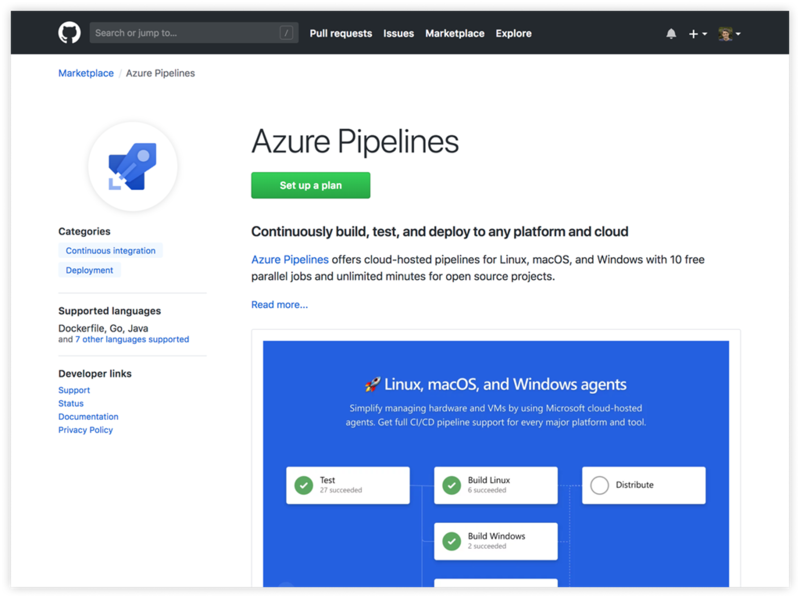 Starting today, Azure Pipelines provides unlimited CI/CD minutes and 10 parallel jobs to every open source project for free. All open source projects run on the same infrastructure that our paying customers use. That means you’ll have the same fast performance and high quality of service. 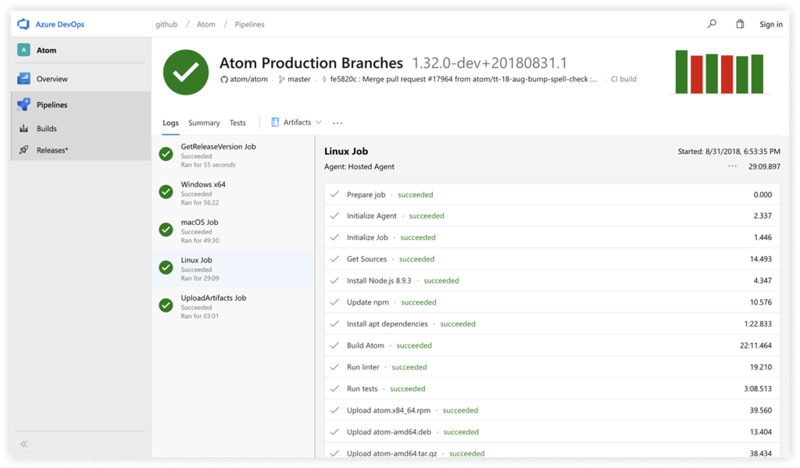 Many of the top open source projects are already using Azure Pipelines for CI/CD, such as Atom, CPython, Pipenv, Tox, Visual Studio Code, and TypeScript – and the list is growing every day. 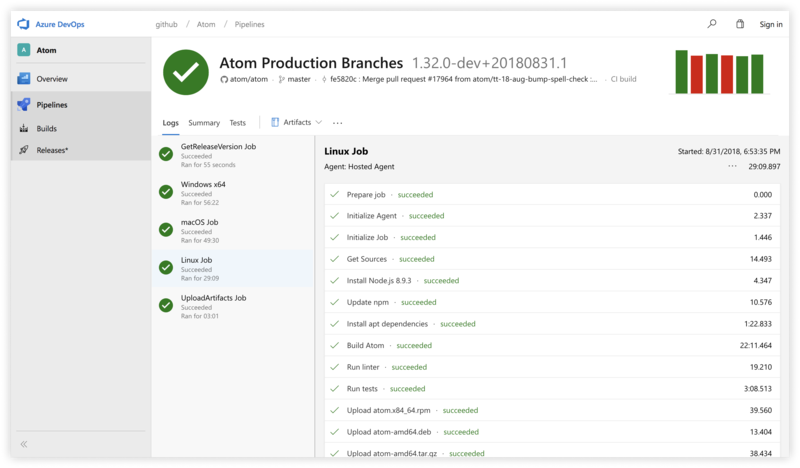 In the following, you can see Atom running parallel jobs on Linux, macOS, and Windows for its CI. Azure Pipelines has an app in the GitHub Marketplace so it’s easy to get started. After you install the app in your GitHub account, you can start running CI/CD for all your repositories. When the GitHub app is setup, you’ll see CI/CD checks on each commit to your default branch and every pull request. Our integration with the GitHub Checks API makes it easy to see build results in your pull request. If there’s a failure, the call stack is shown as well as the impacted files. Azure Pipelines is also great for private repositories. It is the CI/CD solution for companies like Columbia, Shell, Accenture, and many others. It’s also used by Microsoft’s biggest projects like Azure, Office 365, and Bing. Our free offer for private projects includes a cloud-hosted job with 1,800 minutes of CI/CD a month or you can run unlimited minutes of CI/CD on your own hardware, hosted in the cloud or your on-premises hardware. You can purchase parallel jobs for private projects from Azure DevOps or the GitHub Marketplace. In addition to CI, Azure Pipelines has flexible deployments to any platform and cloud, including Azure, Amazon Web Services, and Google Cloud Platform, as well as any of your on-premises server running Linux, macOS or Windows. There are built-in tasks for Kubernetes, serverless, and VM deployments. Also, there’s a rich ecosystem of extensions for the most popular languages and tools. The Azure Pipelines agent and tasks are open source and we’re always reviewing feedback and accepting pull requests on GitHub. Join our upcoming live streams to learn more about Azure Pipelines and other Azure DevOps services. Keynote: Watch our live Azure DevOps keynote on September 11, 2018 from 8:00 - 9:30 AM Pacific Time. Live training: Join our live Mixer workshop with interactive Q&A on September 17, 2018 from 8:30 AM - 2:30 PM Pacific Time. I’m excited for you to try Azure Pipelines and tell us what you think. You can share your thoughts directly to the product team using @AzureDevOps, Developer Community, or comment on this post.